Now it is the Senate’s turn to take up the hazardous waste bill. 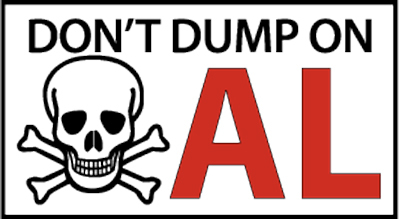 HB181, a bi-partisan effort to reduce the fees hazardous waste haulers have to pay to dump their dangerous chemicals at the Emelle hazardous waste facility, is scheduled for a public hearing in the Senate Energy and Natural Resources Committee at 12:30 p.m. April 23 in Room 325. The bill is an attempt to increase the amount of hazardous waste coming into the state, by reducing the state-based fee from $21.60 per ton to $11 per ton. Hundreds of thousands of tons of hazardous waste have been brought from all over the country and internationally to Emelle over the last three decades, while the facility has experienced numerous fines and a problems related to spills, leaks, and threats to human and environmental health. If you can’t make it to Montgomery for the public hearing Tuesday, you can tell the Senate committee “Don’t Dump on AL” and to vote NO on HB181 by visiting the Conservation Alabama Action Center. Last week, legislation to limit LEED certification for public buildings was approved by a Senate committee, making the bill one vote away from going to the governor. Timber interests have been opposed to LEED because it doesn’t recognize certain industry-favored certifications for timber. More than 50 public buildings in Alabama have been built to LEED standards, all of which used local wood products, making the issue of this one point on a 110-point scale more about principle than policy. Also, a student-led effort to study and protect the drinking water in the Birmingham area has led to House and Senate joint resolutions to be introduced, with the Senate version being dropped last week. The resolutions would establish the Greater Birmingham Drinking Water Commission. The Coalition of Alabama Students for the Environment (CASE) is spearheading the campaign to get the resolutions passed. You can follow legislation related to the environment each week on Conservation Alabama’s Hot List at conservationalabama.org.